Sand dunes are dynamic natural structures. They grow, shift and travel. Sand forms from the erosion of rocks. As rocks break down, the resulting materials are transported by wind and water and end up as sediment in the sea or as sand dunes. Sand dunes can develop wherever there is a supply of dry sand grains mobilised by the wind. In coastal locations they depend on a sufficiently wide beach at low tide, allowing dry sand to be picked up and blown inland. A dune grows as sand grains come to rest around obstacles on the beach such as seaweed or driftwood, behind dune ridges or around foreshore plants such as sea rocket Cakile maritima or lyme grass Leymus arenarius. 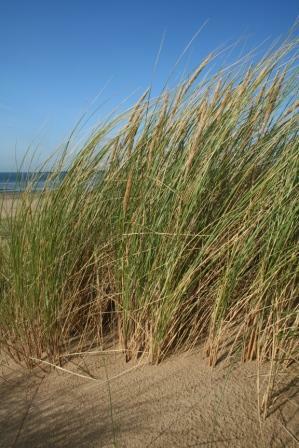 The most important of these is Marram grass Ammophila arenaria, which is the main sand-binding and dune building species. As sand accumulates on a beach area, several forces work together to move deposited sediments inland, where they form dunes. Waves continue to push sand up onto the shore, and winds carry dry sand away from the water. Eventually, piles of this sand become contained and fortified by various grasses, shrubs and other coastal vegetation. These piles of sand are known as coastal sand dunes. Sand dunes are very important to coastal ecosystems; they may need a beach's sand in order to form, but a beach needs a dune's reservoir of sand to replenish itself after a storm. Coastal areas are protected from erosion because sand dunes absorb the effects of storms and surges. Sand dunes also provide a foundation for ecosystems made up of a wide variety of coastal life. Some birds nest in these dunes, rodents carve out extensive burrows, and vegetation and insects of all kinds have adapted to live in a dune's sandy environment. Coastal sand dunes can also be particularly effective at protecting the inland areas which could be vulnerable to storms and other natural disasters [source: NOAA]. Dunes themselves can also be damaged or destroyed by storms. If waves reach heights greater than that of the dune they will destroy the dune itself [source: Sallenger]. Sand dunes are inhospitable places for plants. They lack many of the nutrients essential for plant growth and are typically very dry, often composed of sharp, abrasive grains of sand that are constantly on the move. Nevertheless they are home to a number of specialist species such as marram grass and lime grass. The surrouding salt marshes are also pretty inhospitable places since they are regularly submerged by seawater. Very few plants can tolerate these conditions, but the few that can include grasses such as saltmarsh-grass and various colourful plants like sea aster and sea lavender. Most shingle shores are too unstable for plant colonisation. Where there is a degree of stability, you may find specialist plant species such as sea kale and yellow-horned poppy. Which species might you see? Voles and rabbits are the commonest mammals on the dunes. There are five native reptiles in Wales, any of which may be found on the dunes. These are grass snakes and sand lizards (which lay eggs), and adders, common lizards and slow worms (which give birth to live young). The red kite and chough, and the marsh fritillary butterfly are important species which may be seen here. There are ground nesting birds such as Skylarks and Oyster Catchers which must not be disturbed.